SKU: 247599	. 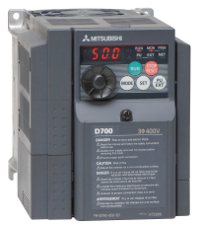 Categories: Mitsubishi D720S 220V Single to Three Phase, Mitsubishi D720S High Performance Single-to-Three Phase Inverters. Tags: 1.5kW, 2.0hp, FR-D720S-070SC-EC, inverter. Purchased Mitsubishi D720S for my Bridgeport mill (2hp) came with in 2 days of order, worked first time by following the excellent instructions supplied by Newton Tesla.